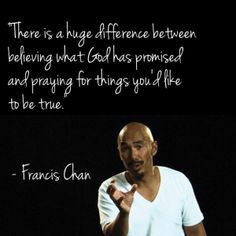 Francis Chan does His best to try and answer that question. His walking away from a church of 5,000 to seek God’s answer to that question, demonstrates his heart and desire to know what God wants for His church. Q: Fans of your books may not be aware that you are in a new season of ministry and church planting. How are things going? A: Things have been going great. Do we have the perfect church? No way—we’re people. But I think we are on to something. While I believe I have loved Jesus for years, it feels totally different now, and I love it. The strangest part about this season of my life is that my intimacy with God has been directly tied to my connection with the Church. This is really weird for me because for years, I felt closest to God when I was away from people and alone in my prayer room. For the first time in my life, I actually feel closer to God while praying alongside my church family! It’s like I can sense His actual presence in the room with us. It makes me want to stay in a room with them all because I want to get as close to Jesus as possible. Just the other day, a one-hour teaching session spontaneously turned into thirteen hours of prayer! We were enjoying His presence together so much that no one wanted to leave! It is an awesome thing to experience God’s presence in a room full of people who truly love Him. Q: You write passionately about God’s desires for His church. Does 30 years of ministry change your sense of urgency? A: Yes, I believe it does. I’ve seen a lot and experienced a lot over these 30 years of ministry. I became a grandpa recently. (It’s weird to say that sentence.) The older I get, the more aware I am that the end is near. There is no time to care about what I want in Church. There’s no time to worry about what others are looking for in a church. Typically, when I speak at a conference, there is a countdown clock letting me know how much time I have remaining on the stage. Sometimes I pretend that the clock is a countdown clock of my life. I imagine that I’ll be standing face to face with God when that timer expires, and I try to say everything I think He would want me to say. If I really was going to die, I would care very little about people’s complaints. I have the same thought now. If I knew I was going to die right after writing this book, what would I write? But even more than that, the warnings in Revelation are very real and we need to take them seriously. Over and over, His message was repent or else. Repent or else. Jesus is coming. We should be urgent about eternal things. I tried to write the book from this perspective. Francis says that the pattern for an effective church is given in the Book of Acts and it is simple: God is present in His Word: As we read, we encounter God and allow others to do the same. God is present in fellowship: As we join together for the mission, people see God. God is present in Communion: As we break bread together, we proclaim the sacrifice of Jesus. God is present when we pray: As we cry out on our knees, we will see God act.